Earlier this summer, a new mega-yacht finally made its preliminary launch. Owned by Russian oligarch, Roman Abramovich, the mega-yacht named “Eclipse” was launched at the Blohm & Voss shipyard in Hamburg, Germany. The yacht “Eclipse” was built under extreme secrecy over the last two years. The mega-yacht is estimated to have cost around $500 million and his planned to be complete by 2010. The “Eclipse” is about 170 meters or 557 feet long, and loaded with safety features such as Abramovich’s armor-plated master suite and the bullet-proof windows. The yacht’s submarine can also be used as escape pod. Now becoming the largest mega-luxury yacht, it exceeds the 525-foot luxury yacht owned by Dubai ruler Sheikh Mohammed bin Rashid Al Maktoum. The “Eclipse” has living space for 24 guests, with a crew of 70. The mega-yacht weighs 13,000 tons, and can achieve a top speed of 33 knots with a cruising speed of 22 knots. The “Eclipse” offers guests two swimming pools, a movie theater and a dance floor. The “Eclipse” yacht will become the fourth boat belonging to Roman Abramovich’s fleet. 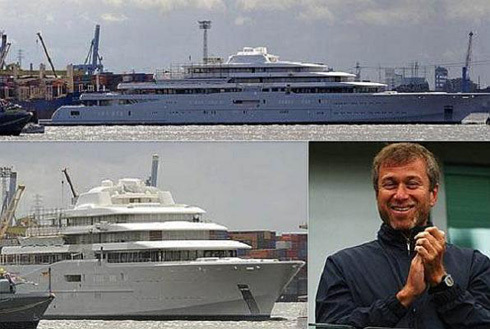 Flaunting his wealth, Abramovich often entertains prospective Chelsea soccer players and powerful British bankers on his yachts. The 42-year-old owner, plans to board his new boat next summer and cruise to next World Football Championship, which will occur in South African Republic.